This week's Scribble Picnic theme is "Generous". I was out in the woods the other day and thought about how generous nature is, in every season that we have here in the mountains. It's all so beautiful, it's really a gift! Then I saw a deer, I love those critters! The deer is an animal that reminds us to be gracious, yet aware of our surroundings. These days I've felt like a deer in the headlights though, zoning out a lot. 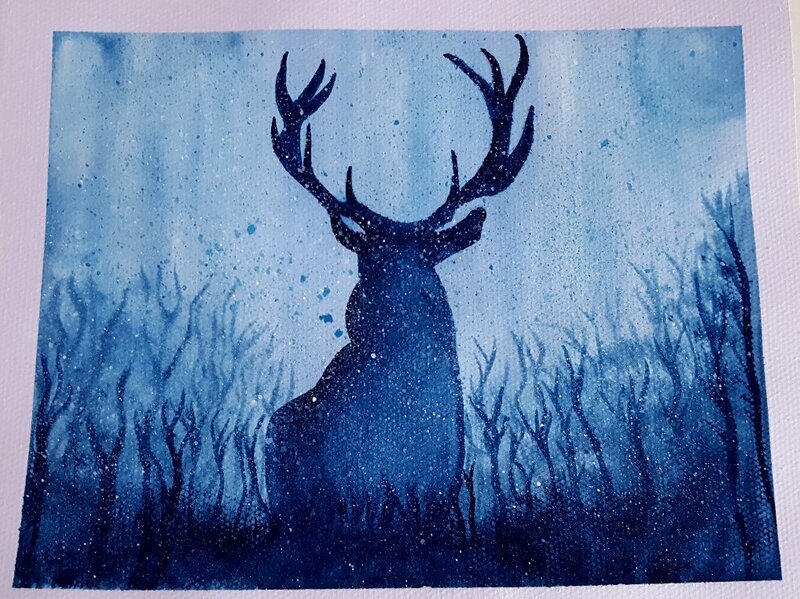 I have never seen a buck in the forest, but I decided to do a watercolour of one because I find them so majestic-looking. Nature has been good to this fella, look at those noble antlers! :) (To see other scribbles, please check out this link). The migraine has now traveled to the left side, so I know I still have a day or so to go before it's gone, sigh. I smell like a black jelly bean from all the fennel tea I'm drinking, but it is helping with the pain I have to say! Here is my first ever attempt at decorating cookies. I used the decorating set that Alex got me, it was fun to do! 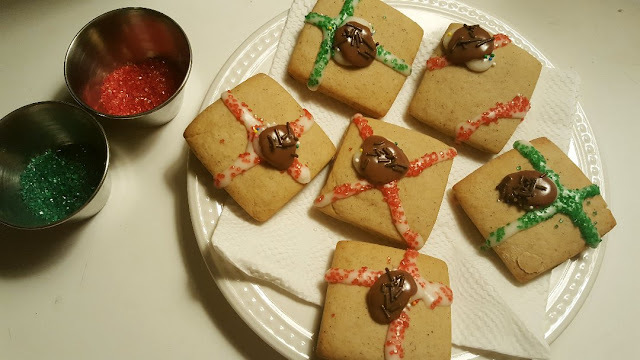 With 30 different decorating tips, I could only get one effect with this cookie icing. But I'm looking forward to the cake decorating soon! :) We can't handle food colouring, makes us both sick, so I stuck to plain white icing with a few bits of chocolate and some sprinkles. It's basically all sugar, which I'm not too keen on, but once a year is acceptable! My artsy cookie photo! These happy little snowmen are cute and delicious! 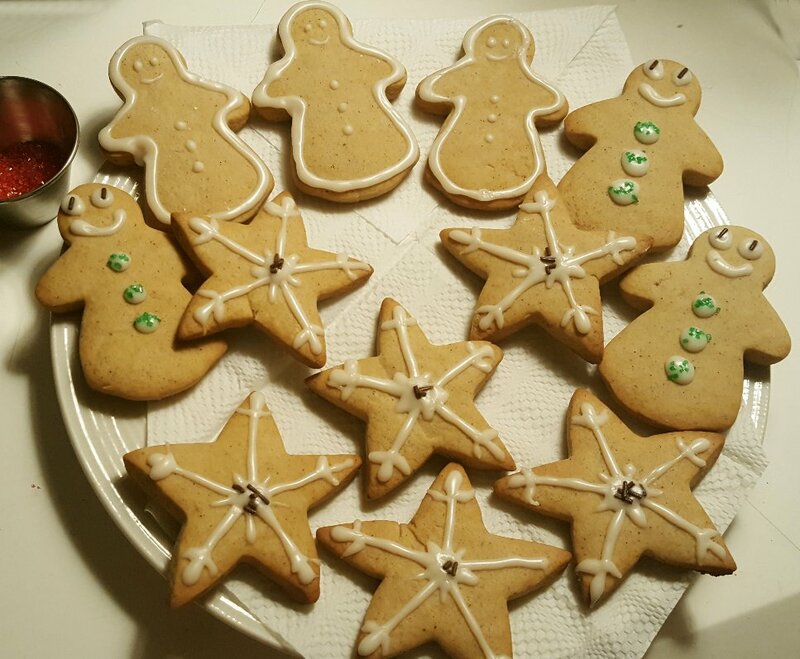 :) I made some "Soft Gingerbread Cookies" this time around. They were good, but I still haven't found the perfect recipe yet! Whenever I try a new recipe, I tend to make two different cookies, just in case we don't like one of them. Not the case this week! These Jam Thumbprint Cookies were so easy to make and yummy. I used apricot and raspberry jam for them. 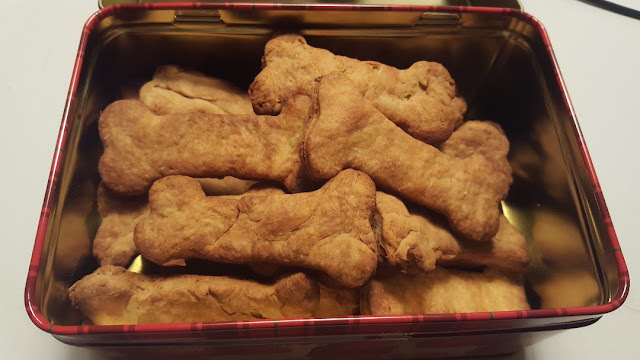 I couldn't forget the dogs of course, They got their Pumpkin Peanut Butter Oatmeal Dog Biscuits. I'm still on the lookout for an easy cookie type treat I can make for the cats - that they won't turn their noses at, but everything I find is tuna or something smelly and fishy! I tried chicken bites once, but they were so hard to make...the cats now get an organic chicken treat from the vet, so they're just as spoiled as the dogs! :) So that's it for the cookies! I did some more baking though. 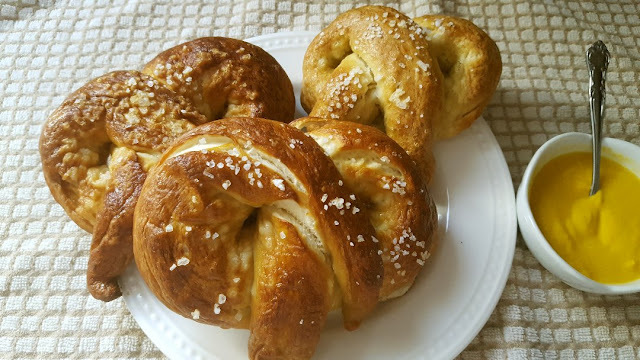 Soft Pretzels. I only make these rarely because they are ultra-filling and a *bleep* to make. They stick to the pan, no matter what I grease it with or line it with...I pretty much need a chisel to take them off...you can't see it, but these pretzels don't have a bottom. I chose to just slice them off the pan rather than fight with the spatula, my energy wasn't there lol...they are delicious though! Love them or hate them? While we were out shopping last week, we saw silicone baking liners on sale from $10 to $2. I thought it would be a nice way to save on parchment paper and foil since our pans are well-worn and we can't really put anything directly on them. HATE THEM!!! Firstly it takes 3 times as long to bake something and when I made more tortilla chips...guess what they tasted like...silicone, YUUUUUUUUUUCK! I soaked them in baking soda and vinegar and tried again...same taste. They will make good pot holders, but that is about it! Could be the brand I bought, "Master Chef", but what a disappointment! Does anyone use these and like them? Wow...you have been busy baking, guessing that migraine is gone, hope so. I am a total sugar nut so those cookies look yummy....and I love how you decorated them. Great pic of the Scribble Picnic! Love it. Have you tried greased parchment (for the pretzels)? Thats what I do, on the rare occasion when I make them, and they don't usually stick to the pan. I have had the same results when I used silicone muffin cups. Yucko! I stick to paper muffin cups and either parchment paper or silpats for baking. I'm with you on the baking trays - mine have too much 'character' to use plain. Love your cookies! Those pretzels to really, really, really good. Guess you can tell I'm hungry. You are truly one of Santa's helpers. What a delicious array of Christmas goodies. The deer is a majestic animal. I love your blue drawing of him...Excellent. Hmm, looks like tomorrow will be baking day. I want to try some of those recipes, I don't ice anything none of us like it. The nearest that i get is a cream cheese and honey mix on carrot cake, I would prefer maple syrup but it is just a bit too runny. Love that Stag. Love the stag painting!! We saw one coming home from our Remembrance Day parade. Ran up the bank from the river, across the road to the other side. They are common here in the city. We have had them at our bird feeders. Two little does - they were sweet! Nice bakings!! I like the snowmen in the snow! :) Our favorites are thimble cookies which are very similar to your thumbprint cookies except ours we roll in egg and then walnuts or pecans then fill with jam. That's on my list for Christmas baking. I have a pretzel recipe that stands true - I have never had them stick. I only use parchment paper. I am wondering about those silicone mats. I bought a bunch of silicone muffin liners from IKEA and my first attempt in baking with them my cupcakes came out very small. I didn't detect a smell from them - but then again my sniffer is not the best. Maybe that's why those ones were on sale? Hope your migraine has left! Gawd, I love thumbprint cookies and yours look de-lish! Your iced cookies look great too, especially the snowflakes/stars. I have deliberately avoided buying any silicone bakeware for just that reason -- the fear that I would taste the chemicals in the silicone. I have VERY sensitive tastebuds for that kind of thing. I'll be interested in reading what your other commenters' experience with silicone is like. What yummy packages, those Camembret. Your cookies made me smile. Festive and cute. I'm glad your turkey came out moist! I was lookin' for the 10 lb one at WF recently but someone had bought it. Love your take on 'generous'...nature does give back over and over. Glad the migraine is improving with fennel tea, who knew that worked. Your cookies look amazing including the dog bisuits. The pretzels look so yummy. I own a silpat silicone baking mat and it works fine except I do prefer to use parchment...less cleanup lol. I think silpat's a good brand. 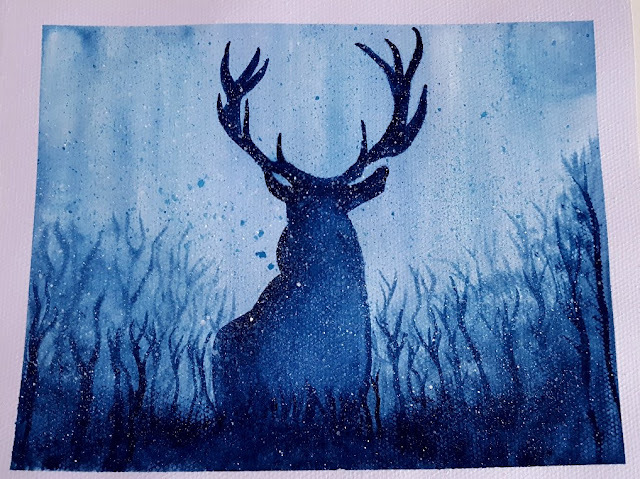 the watercolor deer makes me think of harry potter. I like all the blues in there. good take on the theme. those cookies looks delicous. wish I could reach into the screen and grab some. I like the thumbprint cookies. That artwork is amazing! And your cookies look delicious. I LOVE making cookies. It's one of my favourite things. I tried a silicone baking liner a couple of years back and (like you) I HATED IT. I used it once and then rolled it up and donated it. LOL That was the end of my silicone bakeware adventure. I'll take parchment paper over that any time. 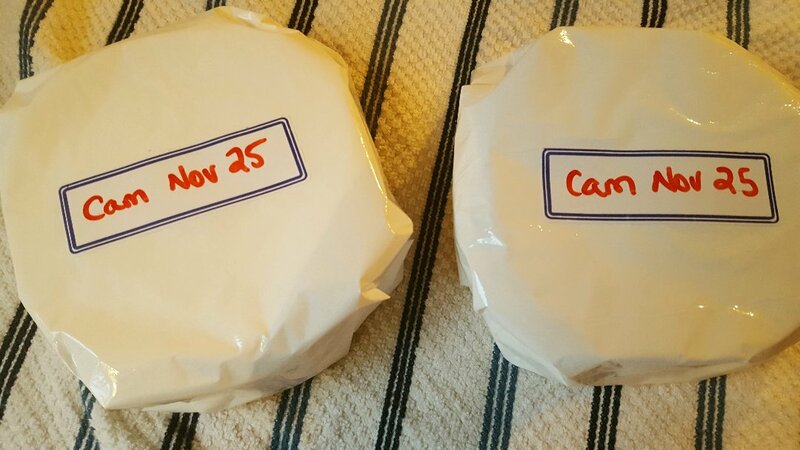 I think I will start my holiday baking next week, in December. I have really cut back on the sweets, unless we need to take a tray to a gathering. I haven't made my cashew brittle for years, so that's on my list. I hope you enjoy cake decorating. I've been doing it since a child. I learned by watching my mother do it, and now my girls have inherited the tools too. I have wondered about those silicone liners. The cookies all look good, but my favorite cookie of all is the jam thumbprint. I agree they are easy, but are always so good. What a gorgeous painting! I especially like how the lines of the chest fur echo the trees. Sounds like I'm in the minority here... haven't noticed any problems with my silicone baking mat, and haven't had any stuck-on food since I started using it. Maybe it's the brand? Mine is a "Baker's 13" mat, "made of food grade silicone conforming to FDA regulations." I am sorry to hear that you get migraines. I hope you feel wonderful soon. You amaze me with all the things you make, from wonderful art to baking cheese and more. It all looks wonderful to me. I havnt done much baking yet but am busy making all kinds of christmas goodies. I am making homemade christmas presents for the whole family this year. So much fun. What a lot of baking!! How can you resist munching away on it! Will some of that be Christmas presents? Hope your headache is all gone soon. It doesn't seem to slow you down though. I have never used silicone pans for baking. I have one I use to make my lotion bars. Wow, so many creative things going on at your place! I love how you've decorated your cookies! And the water color is beautiful! You are really getting the hang of the medium. I have no idea bout the silicone. I've tended to steer away from it. But I like Cozy Thyme Cottages's idea to use silicon pans for lotion bars - I'm thinking soap molds! I am impressed with your abilities not only to cook all of those delicious cookies, but to eat them and not be relegated to waddling about. How do you do it? I love sweets and I really love your pretzels (even bottomless), but I just can't seem to keep them from going to my thighs, etc. I used to bake, but the goodies would be all gone or almost gone before anyone got home from work or school to eat them ... yes, I was the culprit :( so I vowed to not bake anymore and it has worked for me up to a point. Sadly we have a number of wonderful bakeries in driving distance so I can still indulge. You are so talented and your Buck is gorgeous ... and I agree, Nature is generous. I just love the monochromatic painting of the buck. It looks a little magical. You're right about enjoying the generosity of nature. So sorry your migraine is lingering but glad that you got to keep busy and bake. I've also been looking for the perfect gingerbread recipe and like to try new ones. 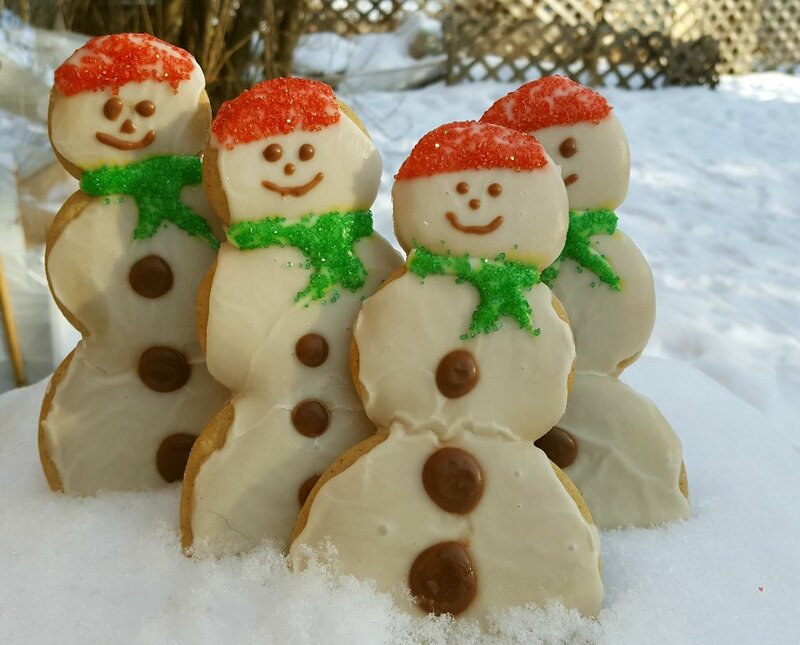 Your snowmen look very delicious! That buck is glorious indeed. I love the way you've depicted him and the colours chosen. What a fabulous interpretation on "generous" too. How true. Thank you, Rain! Your baking know no ends! I love the dog biscuit idea in particular and so love thumbprints in general. It all looks scrummy. Your cookies are adorable and what a lot of work! Your painting is beautiful....it would make a gorgeous Christmas card. You are mighty talented Rain! I hope the migraine is gone by now. It must be awful and really interferes with any plans you have made. I don't have any silicone liners but I use parchment paper. I wanted some but they were pretty pricey. Sounds like maybe you got some rejects for $2 each. Last time I looked a few years ago they were like $25 I thought. Sometimes it's really true that you only get what you pay for. 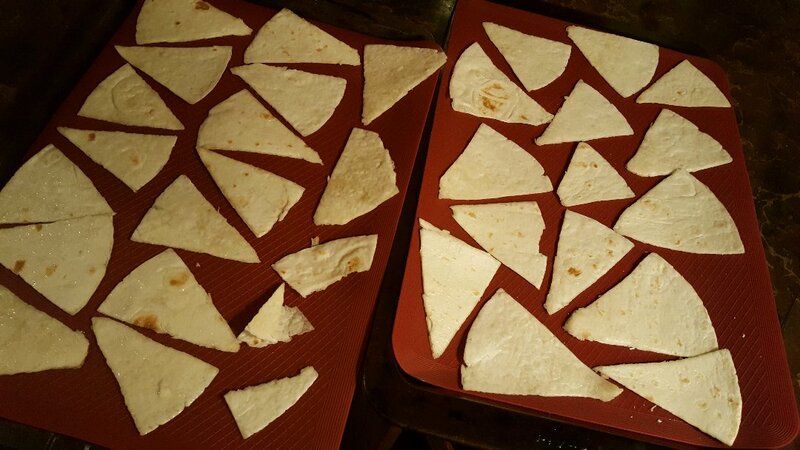 So sad as not only are you out the money but it ruined several batches of your tortilla chips! I make those biscuits for my girls too. I have several other recipes I should send you and I agree....no cat treat recipe I've tried do they like...ever. But they love Friskies Party Mix....it's like a drug....they will do anything...all I have to do is shake the container and they come running...there's definitely some type of drug in them and they are addicted! LOL! Hi Pam :) Thanks! I enjoyed the painting this week. I fully admit I had to trace the horns though, I'm not very good at drawing, so that's why I do lots of silhouettes and landscapes. I kept busy because the migraine wouldn't ease up, that with the tea and it all worked thankfully! Hi Ruth :) I have tried to grease the parchment with olive oil, and butter, but they still stick for me, it could be the brand of parchment I'm using though. I'm going to look for a better quality one next time I'm out shopping. Hi Susan :) I love how you put that "character"...years of baked on thisses and thats lol...I never liked those silicone muffin tins, they're too floppy for me. I just checked on Amazon for the silpat liners, they're a bit pricey but if I can save money on foil and parchment, I'd love to buy those. No smell or taste when you use them right? Hi Wanda :) Thank you :) The deer was fun to do, I love those animals, it's such a treat to see one in the woods. Hi Pam :) Thank you :) I have a cream cheese icing recipe, I'll find it and remember to visit your blog with the link. To be honest, icing sugar is way too sweet for us, but I wanted to make the snowmen look cute so I tried it, but I'm much happier with the cream cheese frosting. I hope you had a good baking day! Hi Dianna :) Thank you! You're lucky to see deer often. I miss that, when I lived further East I saw them daily, it was such a treat! Now they hide in the woods so it's always a chance meeting. :) I've heard of the thimble cookies too. The jams...apricot became slightly sour, so next time I'll stick with raspberry jam. I got the silicone liners at Canadian Tire. They are originally $9.99, marked down to 1.99...that could be why they were so cheap, but they do make good pot holders! Hi Debra :) I love the thumbprint cookies too! They're so sweet! My tastebuds are more in tune with sweet, but Alex's are pretty sensitive too and we BOTH were taken aback at that taste. I think I'll stick to parchment from now on, it's too bad, I really wanted to save money on that expense! Hi Christine :) Fennel tea is going to be part of my "pain plan" from now on. I found a pretty spot-on solution. An Advil, a coffee and a fennel tea. Once I'm half-way down with the tea, the pounding stops. If I feed myself fennel the rest of the day, it stays away. I'm so happy I discovered this! Oh yes, those silicone pads are a mess to clean lol...I'm only using them as pot holders, but they are too floppy to make it easy. I'm sticking to the basics! Hi Lissa :) Thanks, I enjoyed doing the painting. All those cookies are long gone by now! Hi Kristina :) Your daughter is very skilled at decorating cakes! I need to lean how to use all of the different tips, I think it'll be fun :) Alex and I are not usually big on sweets but when it's the Christmas season, we somehow find a sweet tooth to spare lol. Cashew brittle sounds great! Hi Starting Over :) Thank you :) I enjoyed the painting, I wish I could find time to paint every day. 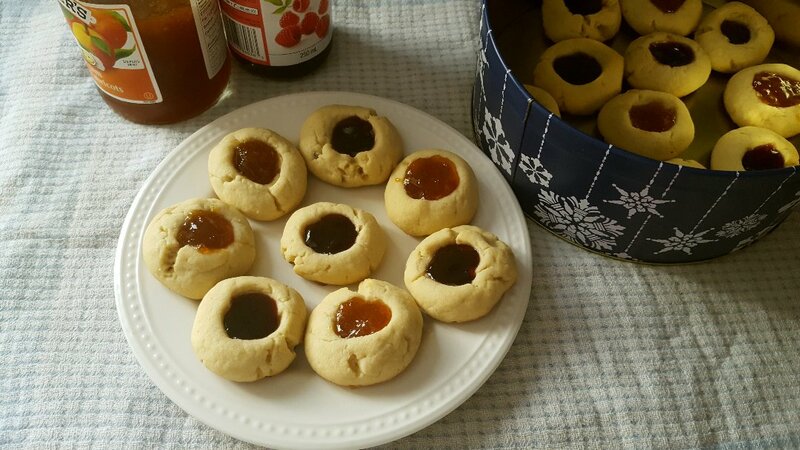 I love easy cookies, those jam thumbprint ones are so delicious, I have to be careful not to make too many lol. Hey Sis :) I haven't had time to check out your calendars yet! I saw that you posted something new. I am dedicating tomorrow to blogs again! :) I think it's nice to make/recieve homemade gifts. Even though I still buy Alex's gifts mosly, I always fit in something homemade, which I won't mention to you because he could read this lol...I'll reveal it after Christmas! I'd LOVE to see a buck in the wild...they hide very well here!! Oh, the migraine today is gone, 13 days of pain though, it's the longest one I've ever suffered. Blah. Hope it doesn't EVER come back! Hi Nancy :) Lol...everything I bake, we EAT. That's why I need PORTION CONTROL lol...Alex and I have no self-control with delicious food so I have to make sure to always half the recipes! I like the idea of using them for lotion bars, that's smart! I had to keep moving or else I felt the pain worse, I did take breaks a lot though, but overall if I keep busy and keep that tea in my system, I don't notice the pain so much. Hi Andrea :) You're so funny...trust me, we DO waddle about all winter ha ha...but it's just keeping in tune with nature isn't it? The bears fill up on lots of food for the winter, so why not us? ;) We usually work it off in the spring. It's a cycle I've been noticing. I think it's nice to indulge once in a while, too bad you gave up the baking though! Hi Michael :) Thank you! I really loved doing that painting. At first I had no clue what to do then a walk in woods, as usual, helped me out and gave me my answer! :) The baking is so much fun for me, I think I was made to be in the kitchen :) I did want to be a chef when I was younger, but my anxiety issues took care of that really quick! I don't know how they do it...Oh I'm sorry you suffered a back ache, the pain can be so unbearable. I've noticed each year I get older that I creak and crack a little more lol...my back hurts every morning now, but it could be my pillows...there are so many variables. I hope your back is better now. It's so frustrating when the medicine just has no effect! First Blizzard! I've Been Baking! Mexican Dinner & Marlene's Birthday!